The F-35B version for the US Marine Corps. All three versions are now completely functional for the Air force, Navy and the Marines. I love how the B can use less runway and needs no catapult to take off aboard ship as seen in this 2011 video. I want to personally thank the family that gave Matty back to his handler, Brent. It was a selfless act that benefited two American Soldiers. ‘I was starting to believe it wasn`t going to happen and then everything all of a sudden started turning around for the better,’ Grommet said. After an initial report on FOX 2, the story was picked up by the national media including Fox News Channel, which did a live interview with Grommet`s father Don, Thursday evening. Grommet gets out of the army in two months, but is trying to arrange it so Matty can live with him on base at Fort Campbell, KY, until his army service ends. ‘It is like a fairy tale,’ Grommet said. 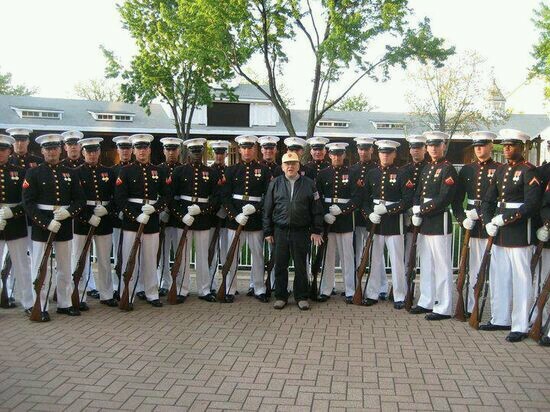 This WWII Veteran only asked ONE of these Marines if he could have a photo taken with him…Semper Fi. Image found on Sgt. Grits Facebook page.